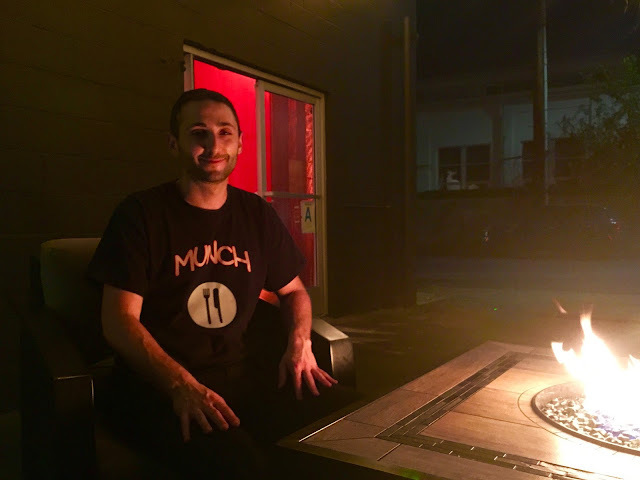 Venice has enjoyed the delicious home cooking of Marla's Cafe for years, and now Marla Barreira has passed her baton off to her son, Matt, and Marla's has become Munch. 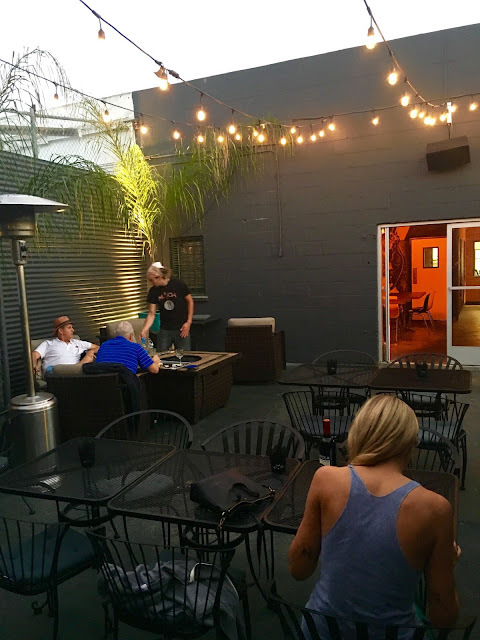 There's a new sign out front, with arrows pointing you around to the brand new back patio that is an oasis of chill right here in the neighborhood. The menu is almost exactly the same, with all of our favorites, so when the carnitas taco craving (or salad, or pasta, or awesome sandwich, or awesome anything ...) , hit last night, we knew right where to go. 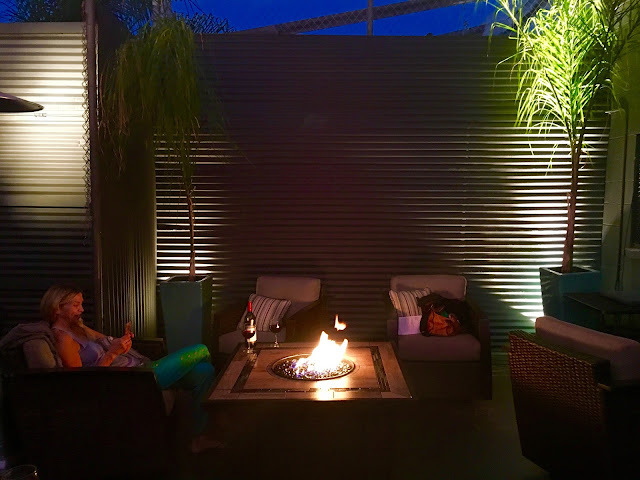 You'll immediately notice that the big Nutcracker (year round) and silk butterflies decorating the outdoor patio have been removed, and replaced by twinkle lights, comfy chairs, and a fire pit to dine by. 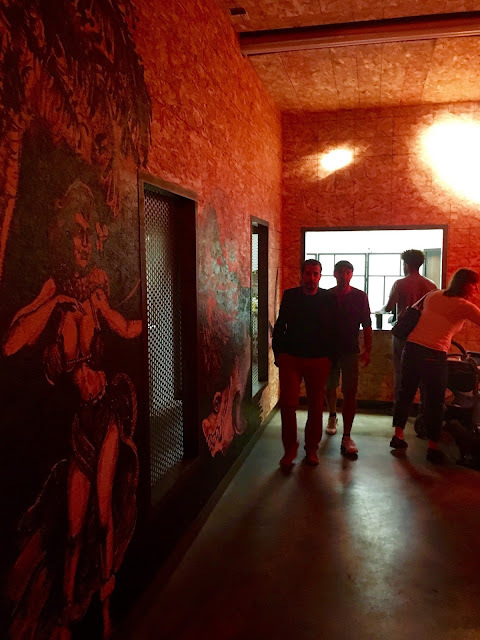 You can now also eat inside, in the newly renovated room adorned with a big, colorful mural created by family friend and artist, Duncan Lemmon. 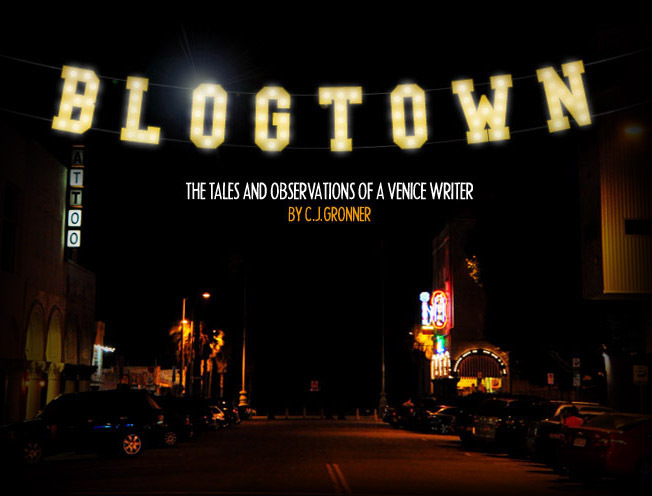 Lowriders rev and hula girls dance around the walls, in a scenario that's perfect for Venice. Munch is consistently delicious, and the line of folks placing after-work orders were all regulars, and all from the surrounding neighborhood - again, exactly what Venice needs to protect and preserve - our Community. I love a place where you regularly hear, "Having the usual?" That's solid. Eating outside is always a delight, and now with the new fire pit (that we took over the second some dudes left), it's extra cozy - especially with the bottle(s) of wine that you bring in, because though there's no liquor license, there's also no corkage. Sipping wine outside after a perfectly satisfying and delectable meal, with a complimentary Marla's cookie, is pretty great. It's great for many reasons, and yet another one is that you can bring your dog, and they'll get their own water bowl and chill right next to you, no problem. Kids love it, Grandmas love it, and so does everyone in between. Though the kids have largely taken over, and Marla is getting a sorely needed break, her hands and heart are still tangibly felt in each dish - that she created. And honestly, I've never had better carnitas - Anywhere. 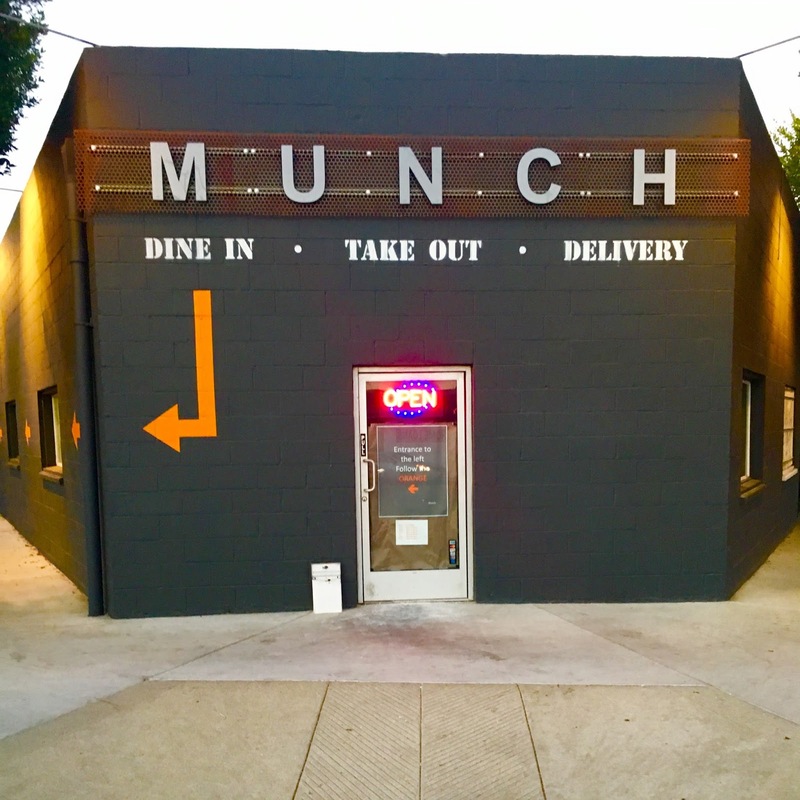 Munch serves their great food until 2:30 am - and delivers that late too - so there is never a need to subject yourself to a drive-thru or anything like that after the party. In fact, the party will most likely be happening at Munch when you get there late too. 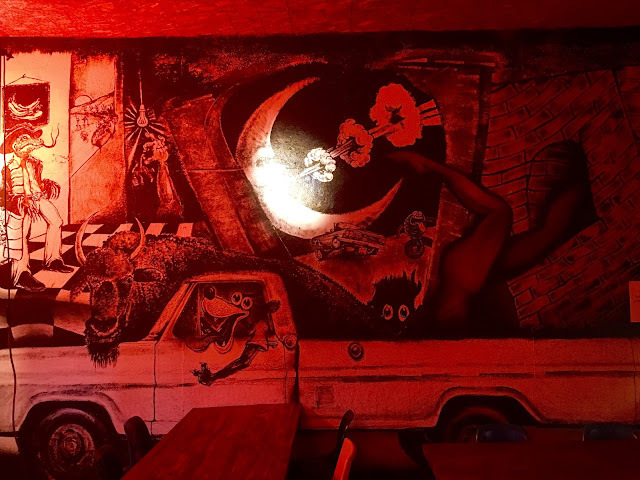 They're having an art opening for their muralist and several other local artists on August 5th, and that night promises to be way better than the First Friday stuff going on up the street. Locals are always recognized and hooked up, and you can just tell that the love is there, in everything they do. Matt Barreira and his family call their brand of cuisine "Feel Good Food", and it is certainly that. Freshly made, home recipe food is the Barreira family tradition, and I'm thrilled to see it being carried on in such a new and excellent way. I'm looking forward to seeing you all there - all the time. Great enjoyable moments hun? I miss some of my memories in this place.